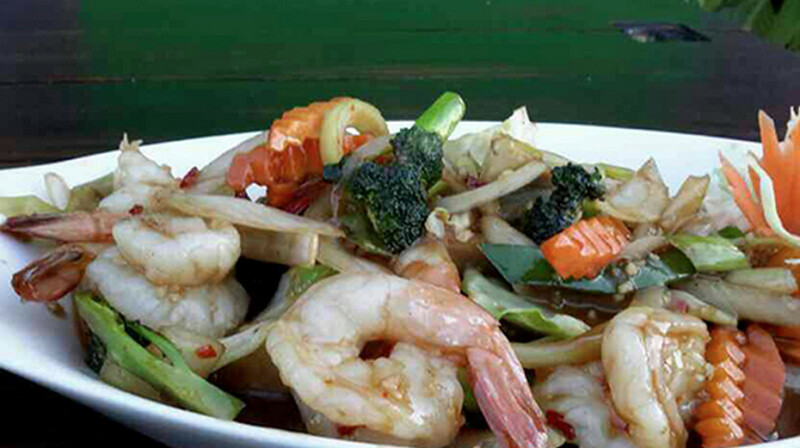 In Thai culture, food is very important. It brings people together to share laughs, love, and life. 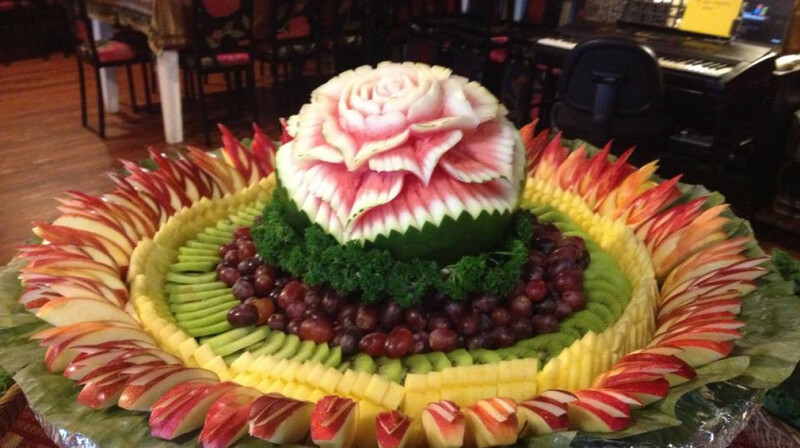 At Red Elephant, you’re welcome to come and join in the amazing culture of Thailand. 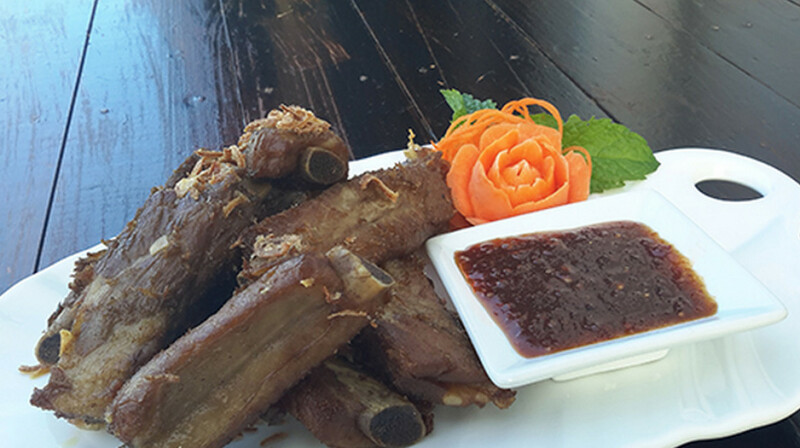 The menu features a vast range of Thai classics, including curries, noodle dishes, rice dishes, and a kids menu. 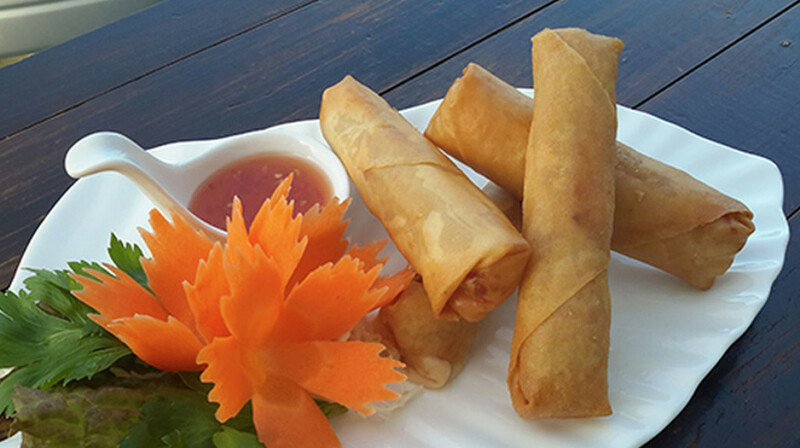 Vegetarians will find a large portion of the menu caters to you, with tofu or vegetable variations on many of the menu items. Why not leave it to the people who know best to choose for you? 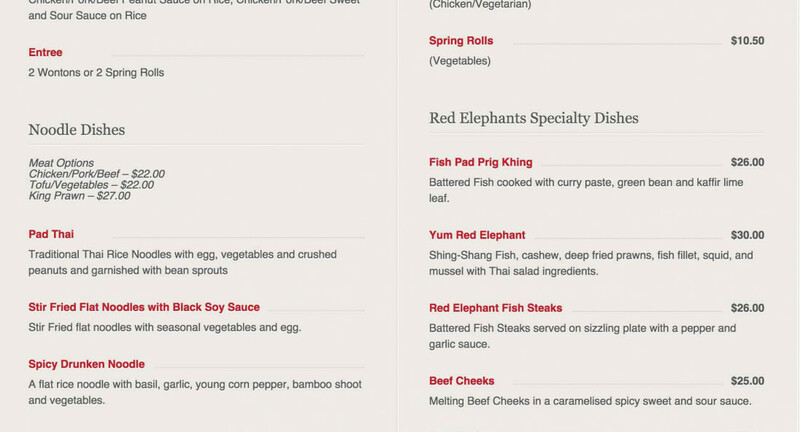 The Red Elephants specialty menu is hard to beat. 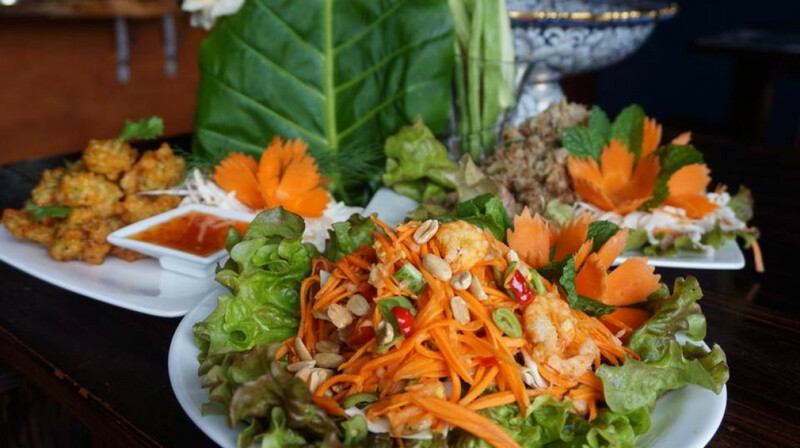 The team at Red Elephant bring the heart of Thailand to you, with friendly service and meals crafted with love. Nice atmosphere with Thai deco. Food was reasonably good but the quantity was small. It would be nicer if the taste was not that sweet as we asked less sugar. Fantastic restaurant , service was outstanding and food was perfect. Meal and service were great, an easy recommend. Enjoyed the meal. Great service. The staff were very friendly. The food was nice but missed the mark on a couple of dishes. Spur of the moment decision to try out a new restaurant but wow was it worth it!!!! 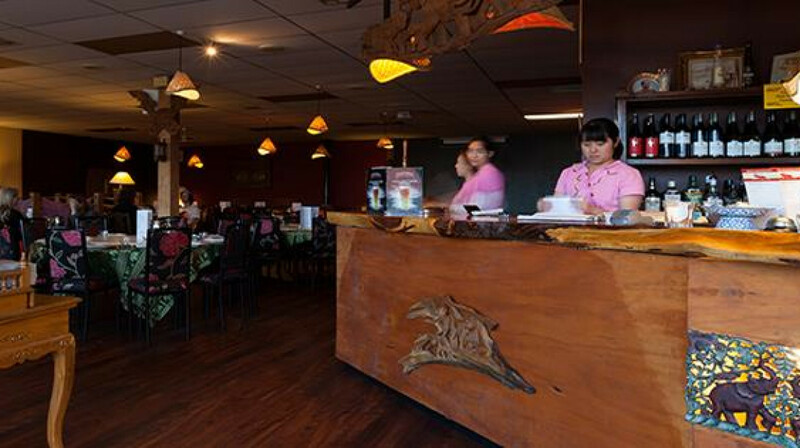 The Thai food here is as authentic as it comes, as good as in northern Thailand. We enjoyed our delicious curry puffs, Penang curry and cashew and veges meal. Beautifully presented and fresh veges. Will def go again!! Great tender pork and lovely service. Big menu and big portions, relaxed fun night! Out of the 4 dishes we ordered the Tom Yam soup were divine enough spice and heat to warm you.The beef cheeks is tasty but the green curry beef was too sweet and the roast duck red curry was a let down. Really tasty food and staff were friendly and helpful. Google maps was a bit misleading but the location is easy to find behind Dennys. We were there at 5.30 and there was a constant flow of people coming in so other people obviously knew about this place long before us. Good value. Great food and we loved the environment, beautiful decor. We will be back. Fantastic food, service and location. Thoroughly recommend. Catching up with a colleague at Red Elephant was great cause the 5.30 booking is ideal for those who work until 5pm. 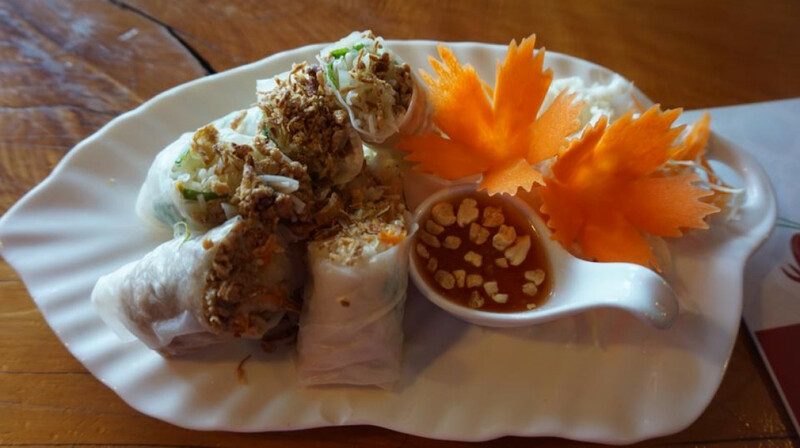 The service was pleasant and efficient throughout and the food delicious - a return visit is on the cards! How did we not know about this restaurant sooner?! The food was absolutely delicious! What a sensory explosion, flavours and dishes that really brought me back to my time in Thailand. Will absolutely go back for the fabulous food! Excellent, authentic food. Outstanding service, great ambience and we'll be back. Thank you. 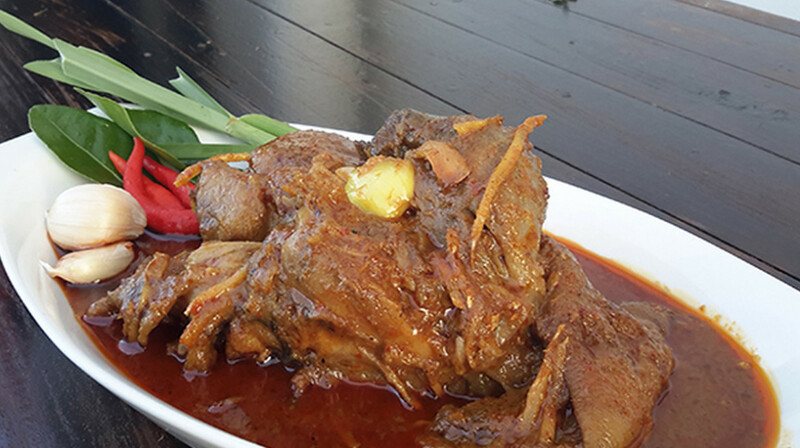 Large portions, delicious and flavoursome meals. Even had the chef come out and show us how she carved the intricate carrot garnish. Definitely will visit again. Thanks. Another great time had at this restaurant. Delicious food and great service. Will dine here again. Great food, timely delivery etc. Limited wine list and a couple of noisy intrusions ahead of introduction of Thai dancer which was not advertised for a Wednesday evening. The food was excellent as always, really tasty and food came out fast too! Lovely place to dine ,staff were super efficient and friendly,would have liked to have seen the dancers but they were not on that night,recommend to all for a lovely night out with tasty food.what more can you ask for! We dined here for dinner on fathers day. It was great! Friendly staff great service and yummy food! And the kids loved the thai dancing! Food was good, but I was expecting better with the reviews I had read. Was a little cold in there as well. The small staff managed well with the busy groups of bookings on the night. Overall, I would probably go back, but not rush back there. Excellent and Easy Process. 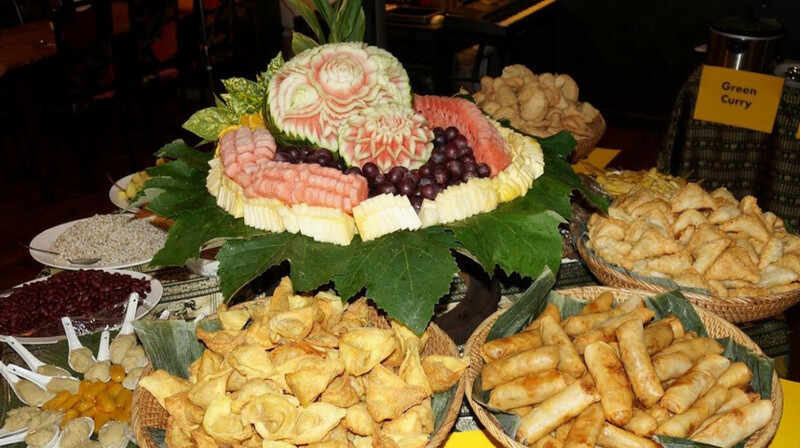 The Red elephant have always got tasty food! and have always got such helpful and friendly staff. On a cold windy afternoon the Red Elephant offered a superb dining experience. 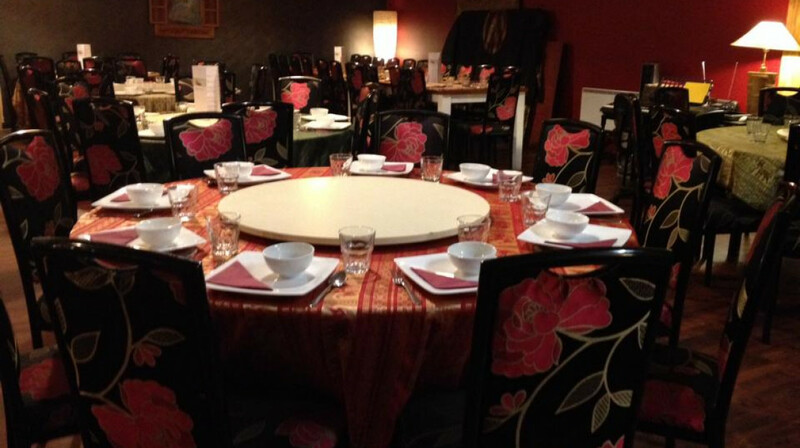 The service was quick and attentive; our drinks and meals arrived quickly and were so tasty and presented beautifully. The restaurant was almost full when we left - and no wonder. A great dinner for Father's Day! Lovely cosy dining experience, amazing food and friendly service. Brought my daughter and grandmother and everyone enjoyed - especially the giant kids' sundae at the end! 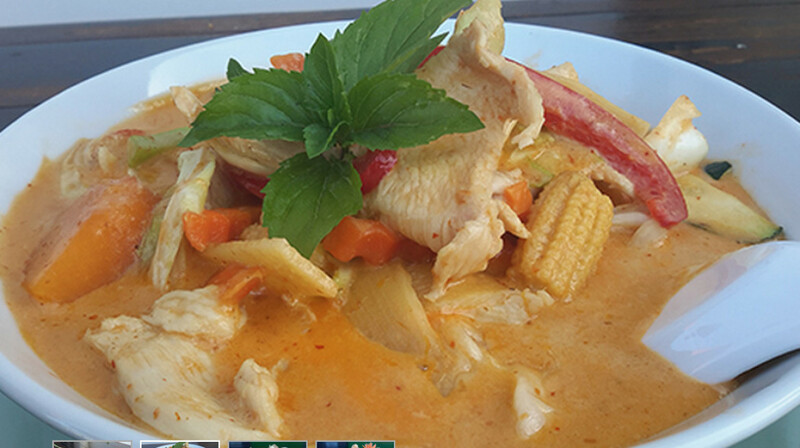 Highly recommend the red curry - it was just delicious! Very creamy and flavourful. Also very fast, friendly service. Wow just wow, traditional Thai setting that felt very welcoming and the flavours of traditional Thai food really satisfied the taste buds. We had a wonderful meal and experience at The Red Elephant, the service was top notch and the food was out fast and tasted delicious. The meals were larger than the portion size I get other places so this was also a win too. Being a mum for the first time and not getting out much I truly enjoyed my dinner and highly recommend this place.